Diarrhoea is defined as 'the passage of three or more loose or liquid stools per day (or more frequent passage than is normal for the individual)', which is the second leading cause of death in children under five years old. The common agents that cause the disease include viruses, bacteria and parasites. Among the bacteria, campylobacter spp. act as the agents of zoonoses seen worldwide causing both diarrhoeal and systemic manifestations. They are considered as commensals of gastrointestinal tract in wild and domesticated cattle, sheep, goats, etc. Different species of campylobacter spp. have been isolated from the faecal samples of dairy cows and calves. For humans, poultry is the major reservoir and source of transmission. Water also could be a source. Infection is contracted by consuming contaminated food and water. Among the campylobacter spp., Campylobacter jejuni infection is common in children below five years of age in developing countries. Direct examination of stool by dark-field microscopy can permit a rapid diagnosis in cases of diarrhoea. As campylobacter spp. grow only microaerobically on selective media, most of the laboratories do not try to cultivate these bacteria due to the lack of facility. This article presents a case of diarrhoea in an infant due to campylobacter spp. A five-month-old baby was brought to the paediatric outpatient department of a tertiary care hospital in Thrissur, Kerala, India, with complaints of fever and diarrhoea. The child was on weaning. Macroscopic examination showed the stool as watery with mucus. There was no blood. On microscopic wet mount examination of the stool sample, plenty of pus cells and motile bacteria were seen. Gram staining showed pus cells and plenty of Gram-negative curved and spiral bacilli, suggestive of campylobacter spp. [Figure 1]. Culture was performed on MacConkey agar, deoxycholate citrate agar, bile salt agar (BSA) and thiosulphate citrate BSA. It was inoculated to the enrichment media alkaline peptone water and selenite F broth, which were subcultured. No shigella spp., salmonella spp. or vibrio spp. was isolated even after enrichment. Because of the strong suspicion of the presence of campylobacter spp., on the same day itself, the sample was taken to the Laboratory of Veterinary Public Health, College of Veterinary and Animal Sciences, Mannuthy, Thrissur, Kerala, India, for its isolation and identification. Campylobacter spp. was grown after the enrichment of stool in modified charcoal cefoperazone deoxycholate broth (mCCD) and inoculation on the selective medium mCCD agar with polymyxin B under microaerophilic condition. The isolate was confirmed as Campylobacter. jejuni by multiplex polymerase chain reaction (PCR) according to the standard procedure. 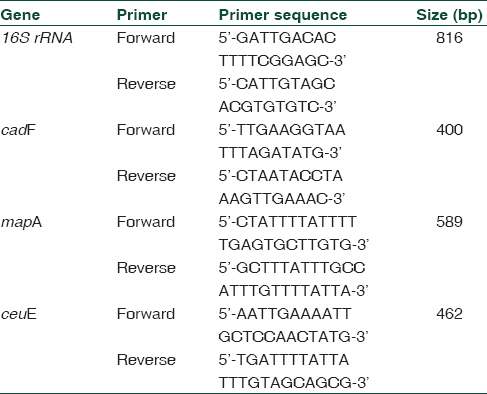 Sets of forward and reverse primers used for 16S rRNA, cad F, map A and ceu E are summarised in [Table 1]. The reaction mix of PCR comprised isolated template DNA (50 ng/μL); ×10 PCR buffer (200 mM); MgCl2(20 mM); Taq DNA pol (5 U/μL); dNTP mix (2 mM each); nuclease-free water and primers of 16S rRNA (10 pM/μL), cad F (20 pM/μL), map A (10 pM/μL and ceu E (10 pM/μL). The mix was amplified in a thermal cycler 9700 using the following programme: the initial denaturation at 95°C for 10 min (1 cycle) was followed by final denaturation at 94°C for one minute, primer annealing at 51.8°C for one minute and primer extension at 72°C for one minute. Final denaturation, annealing and extension, was done for 30 cycles. The final extension was done at 72°C for 10 min and the final reaction product was held at 4°C for 10 min. The products were analysed in agarose gel (1.5%) and stained with ethidium bromide. C. jejuni was identified by the presence of a single band at 816, 589 and 400 bp regions of DNA marker ladder. Among campylobacter spp., C. jejuni is the most often isolated species from the clinical samples in patients with diarrhoea. Even though there are many sources, poultry may be the primary source for these organisms. Most infections are believed to result from the ingestion of contaminated food; non-food exposures in the epidemiology of sporadic campylobacteriosis are still unknown. Campylobacter spp. are microaerophilic and they need specific conditions to grow in the culture. Hence, often the presence of these bacteria is missed in the routine culture of stool samples. Wet mount examination by phase-contrast microscopy may be helpful to see the motility. However, not all laboratories engaged in the stool analysis may be equipped with the phase-contrast microscope. Moreover, the presence of campylobacter spp. may not be expected in geographical areas where their presence is not yet proved. In Kerala, the prevalence of these organisms in the poultry is studied. In our patient, the presence of campylobacter spp. was first detected by Gram stain examination of stool samples. The presence of other pathogens such as salmonella spp., shigella spp. and vibrio spp. was excluded by using the necessary enrichment of stool sample. The infection was confirmed as C. jejuni by multiplex PCR by the presence of a single band at 816, 589 and 400 bp regions of DNA marker ladder. The Clinical and Laboratory Standards Institute recommends agar dilution and broth microdilution for the campylobacter spp. antibiotic susceptibility testing. The antimicrobials used for testing are Macrolides, Quinolones and Tetracyclines. The baby was treated with Erythromycin and recovered well. No antibiotic treatment is needed for this type of diarrhoeal illness in adults and rehydrating the patient is enough. Campylobacter spp. with resistance to Macrolides such as Azithromycin have been reported from northeastern part of India. In Taiwan and Spain, the resistance rates of C. jejuni to the Macrolides of 10% and 11% had been reported, respectively, while in Bulgaria, Singapore and Nigeria, higher rates of resistance of 31%, 51% and 79% had been reported, respectively. In our patient, the source of infection could not be traced out. Most probably, the source could be milk or water contaminated with these organisms. The procedure for the detection in milk was demonstrated by Modi et al. Briefly, after adjusting the pH at 7.5, milk is centrifuged at 14,000 rpm for 20 min at 4°C and the sediment is inoculated to Preston enrichment broth base containing Preston enrichment supplement. It is subcultured on selective media. For water, water should be filtered through 45-μm Zetapor filters and filters should be placed into the enrichment broth. Water and milk analysis is essential if any outbreak occurs. The source detection in sporadic cases is difficult. It can be concluded that campylobacter spp. 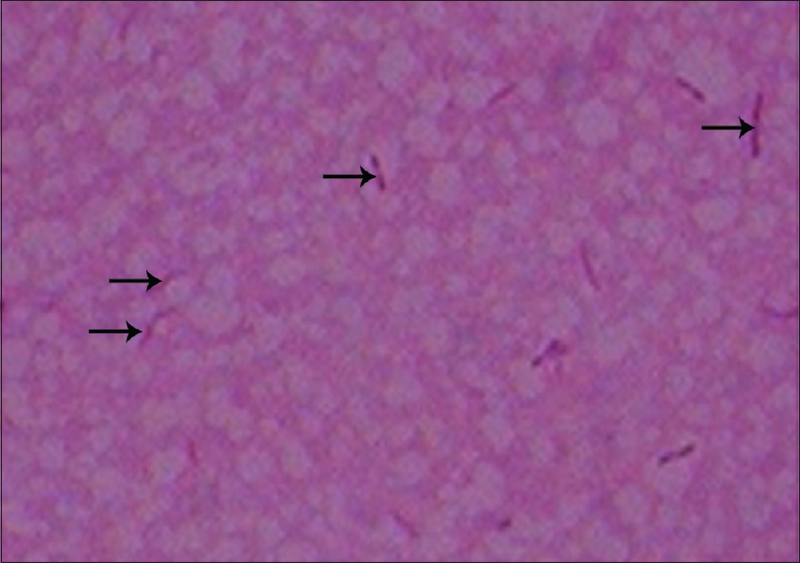 infection is present in this area (Thrissur, Kerala, India), and Gram stain examination of all stool samples from acute diarrhoea, particularly in children with a history of weaning with cow's milk, may help the preliminary identification. The consent had been taken for samples and publication from the mother. The authors certify that they have obtained all appropriate patient consent forms. In the form, the patient's guardian has given her consent for her child's images and other clinical information to be reported in the journal. The patient's guardian understands that her child's name and initials will not be published and due efforts will be made to conceal the child's identity, but anonymity cannot be guaranteed. The authors acknowledge the valuable help of Dr Sunil B, Professor of Veterinary Public Health, College of Veterinary and Animal Sciences, Mannuthy, Thrissur, Kerala, for the molecular identification of Campylobacter and Dr Ajith TA, Professor of Biochemistry, Amala Institute of Medical Sciences, during the preparation of the article. Diarrhoeal Disease. Available from: http://www.who.int/news-room/fact-sheets/detail/diarrhoeal-disease. [Last accessed on 2017 May 02]. Blaser MJ. Campylobacter jejuni and related species. Mandle, Douglous and Bennet's Principles and Practice of Infectious Diseases. 5th ed., Vol. 2. Philadelphia: Churchill Livingstone; 2000. p. 2276. Blaser MJ, Taylor DN, Feldman RA. Epidemiology of Campylobacter jejuni infections. Epidemiol Rev 1983;5:157-76. Atabay HI, Corry JE. The isolation and prevalence of Campylobacters from dairy cattle using a variety of methods. J Appl Microbiol 1998;84:733-40. Kaakoush NO, Castaño-Rodríguez N, Mitchell HM, Man SM. Global epidemiology of Campylobacter infection. Clin Microbiol Rev 2015;28:687-720. Glass RI, Stoll BJ, Huq MI, Struelens MJ, Blaser M, Kibriya AK, et al. Epidemiologic and clinical features of endemic Campylobacter jejuni infection in Bangladesh. J Infect Dis 1983;148:292-6. Paisley JW, Mirrett S, Lauer BA, Roe M, Reller LB. Dark-field microscopy of human feces for presumptive diagnosis of Campylobacter fetus subsp. jejuni enteritis. J Clin Microbiol 1982;15:61-3. Skirrow MB. Prevalence of Campylobacter spp in foods and sources of infection. Br Med J 1977;2:9-11. Jacob R, Mathew B, Latha C, Neethu KP, Sunil B. Campylobacter from Backyard Poultry in Kerala, India. J Food Borne Zoonotic Dis 2017;5:12-5. Ge B, Wang F, Sjölund-Karlsson M, McDermott PF. Antimicrobial resistance in Campylobacter: Susceptibility testing methods and resistance trends. J Microbiol Methods 2013;95:57-67. Mukherjee P, Ramamurthy T, Mitra U, Mukhopadhyay AK. Emergence of high-level azithromycin resistance in Campylobacter jejuni isolates from pediatric diarrhea patients in Kolkata, India. Antimicrob Agents Chemother 2014;58:4248. Alfredson DA, Korolik V. Antibiotic resistance and resistance mechanisms in Campylobacter jejuni and Campylobacter coli. FEMS Microbiol Lett 2007;277:123-32. Modi S, Brahmbhatt MN, Chatur YA, Nayak JB. Prevalence of Campylobacter species in milk and milk products, their virulence gene profile and anti-bio gram. Vet World 2015;8:1-8.